Last week, the prime minister said Northern Ireland was unable to prepare fully for a no-deal Brexit because of the collapse of devolution. 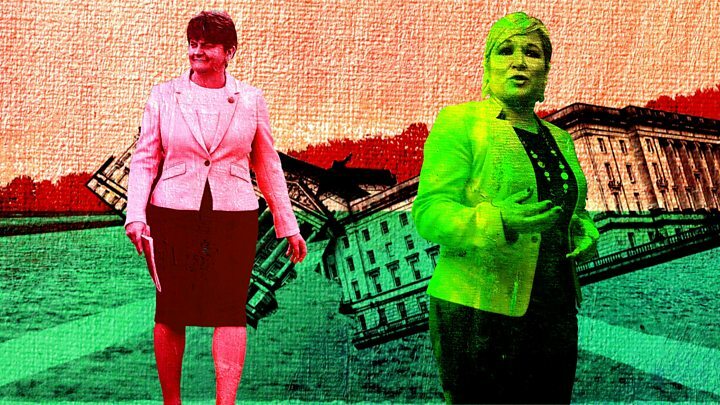 Northern Ireland has been without a functioning government since 2017, when the power-sharing parties split in a bitter row. The UK could leave the EU without a deal on 12 April, if Parliament does not find a way forward. But would no deal mean the return of direct rule for NI from Westminster? What is direct rule for Northern Ireland? Why is NI without a government? The power-sharing institutions collapsed in January 2017, when Sinn Féin's deputy first minister Martin McGuinness resigned, in protest at the DUP's handling of a flawed green energy scheme. Known as the Renewable Heat Incentive (RHI) scheme, problems with its design meant it led to an overspend, which could cost NI taxpayers £490m. A snap assembly election and failed talks processes saw no end to the impasse, with Stormont civil servants having to take some decisions in the absence of elected ministers. The UK government has passed several budgets for Northern Ireland through Parliament, with the Secretary of State Karen Bradley also taking on some powers. However, a lot of decisions including compensation for victims of Historical Institutional Abuse (HIA), infrastructure projects and health care reform, remain stalled. The government has said its duty is to ensure governance continues, but is reluctant to intervene further and is working to restore devolution. But a no-deal Brexit could change all that? On the BBC's Andrew Marr show on Sunday morning, the Justice Secretary David Gauke said a no deal Brexit puts Northern Ireland's place in the UK in doubt. He said: "Moderate nationalist opinion in Northern Ireland is reconciled to its position in the United Kingdom. "In the environment where we have left without a deal where we will have imposed direct rule, which we would need to do and where we were heading towards a hard border between Northern Ireland and the Republic of Ireland, I think that puts it in some doubt - the future of Northern Ireland's place in the UK." Mr Gauke is the fourth government minister to suggest the possibility of direct rule. The suggestion was first raised by Environment Secretary Michael Gove, during the second phase of voting on the government's Brexit deal. He argued that direct rule was a "real possibility" if the UK left the EU without a deal that the government would have to consider. While on Wednesday, Karen Bradley said in a no-deal scenario, the government would have to take steps with regard to obligations under the Good Friday Agreement, and consult with the Irish government about how decisions would be made for Northern Ireland. "It would be to deal with short term impacts of no deal... health, education, people can get to work, that hospitals continue to function, so medicines are available as needed... that's the kind of things we'd be focusing on in that scenario," she added. How many times has NI been placed in direct rule? Media captionWhy doesn’t Northern Ireland have a government? Northern Ireland was ruled directly from Westminster between 1972 - when the Northern Ireland Parliament was prorogued - and 1999 when the new power-sharing assembly was established. Direct rule was introduced again on a number of periods when power-sharing broke down, including between 2002 and 2007. The system has so far not been re-introduced during the current impasse, but some have accused the Northern Ireland secretary of presiding over "direct rule in all but name". Some politicians and commentators have also argued that "a form of" direct rule has been happening in Northern Ireland for some time now, albeit at a slow, drip-like pace, because of some decisions Karen Bradley has taken. What is the prime minister's view? 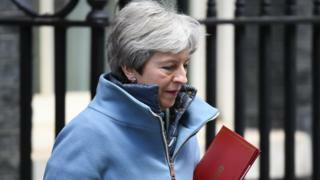 On Monday, Theresa May told MPs it "would not have been appropriate" for no-deal to go ahead on 29 March because "the Northern Ireland civil service do not have the powers to take necessary decisions in the event of no deal". She said a no-deal Brexit would require some "direct application of powers" from Westminster to Northern Ireland. "If there is no Stormont government, if powers are needed and ministerial direction is needed which is not available to the civil servants currently, it would require some form of direct application of powers here from Westminster," she said. A source linked to NI's no-deal preparations has told BBC News NI they expected Westminster would have to step in, if there was a need for a legislative response to a no-deal Brexit. Talked to @niexecutive source regarding north south agri-food trade after Brexit who expressed more concern about regulations than tariffs - said if all NI produce is regarded as not meeting EU regulations could amount to a "blockade"
How does the DUP view a return to direct rule? There has been some media commentary that the risk of direct rule could push the DUP into backing the government's deal - but it is unfounded. The DUP has been publicly calling for direct rule to be reintroduced in Northern Ireland for some time, in the absence of a breakthrough in political talks. Given the party's influence at Westminster, it is unlikely to be overly concerned that a no-deal Brexit could mean direct rule. It has insisted it does not want to leave the EU without a deal, but said no deal would be better than the PM's deal. That being said, the party's deputy leader Nigel Dodds has criticised Mrs May for suggesting NI's unpreparedness for a no-deal meant the UK could not leave the EU on 29 March. In the Commons, he accused Mrs May of a "fundamental lack of preparation" and said the exit date had been known for some time. What do other political parties say? The other main parties have all warned against a no-deal Brexit, and are also opposed to the re-introduction of direct rule. They have urged talks to restore devolution to take place, but last week the government announced it was putting efforts to restore power-sharing on hold until after the local government elections in May. The SDLP has called for joint authority between the Irish and UK governments, as the only "acceptable position for the nationalist community". This has previously been ruled out by the Northern Ireland Office, but the Irish government had said direct rule from London could not be imposed without Dublin input. Is direct rule likely to happen? A lot depends on what happens during the next few weeks with Brexit. The British government says its priority remains restoring devolution, and that direct rule is not a preferable outcome. But if a deal isn't passed in Parliament, it may decide it has no other option in the short-term.